The church of Gesù Nuovo in the square of that name once formed a very large single complex with the two buildings on either side: one, the former building of the Congregations on the west (photo, right—the "Congregations" is the building on the far right) and, two, the House of Prayer of the Jesuit Fathers, on the east (not seen here, it is back next to where the photographer is standing). The "Congregations" now houses the Genovesi High School and the House of Prayers houses another school, the "Pimentel Fonseca" Institute. They are both rather inconspicuous because of all the competition. 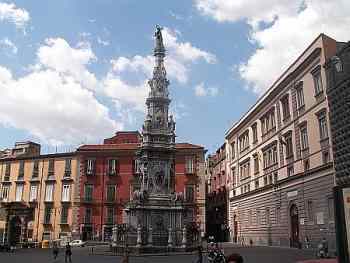 The giant plague column in the middle of the square, the church of Gesù Nuovo, itself, and the church of Santa Chiara all attract our first attention.